Have you been rocking at-home workouts this winter like I have? Lately, I've been using Gigabody to motivate me to change up my routine. Gigabody.com is the best place to find empowering online workout videos that help you rock a healthy lifestyle. With Gigabody, find all your favorite workouts and do them anywhere, anytime - cardio, sculpting, yoga, dance, kickboxing and so much more! 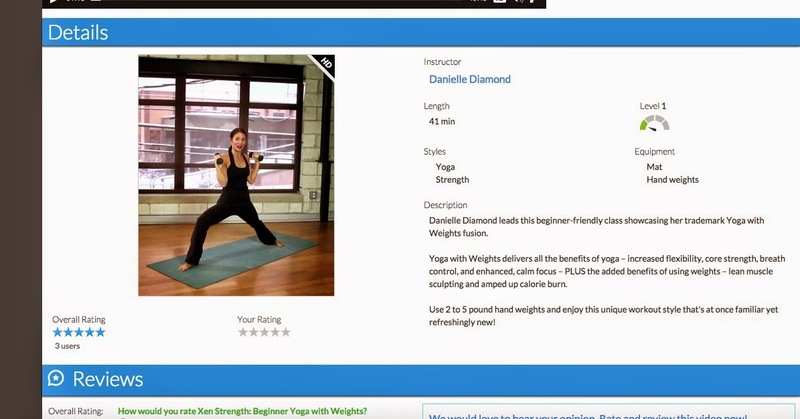 Here are a few screen shots of some of the workouts I've been having fun with, including Bollywood dancing, yoga and strength training! While I am truthfully not a good dancer, I loved trying to follow along with Bombay Jam! It was intense. I always enjoy a good yoga class too. Follow Gigabody on Twitter (@gigabody) and Instagram (@gigabody) and leave me a comment telling me you followed them on both social media platforms. Tweet about the giveaway and leave the link in a comment below. *Note: the winner will have to enter a credit card to register for Gigabody, but you won't be charged and can cancel at any time during your free month. I'll pick a winner on Monday, February 9th. Good luck! Disclaimer: I received two months of Gigabody for free in exchange for this review. Hello! It's been a while since I checked in on the blog, but I am ready to come out of my funk! I just haven't felt motivated or very positive lately. I want to change that though! I think I need more Vitamin D. I miss the sunshine. I was off today because I worked all weekend. My workplace was the busiest it's ever been (in 135 years) and that meant lots of time on my feet. I was pretty tired of people and so a quiet morning cuddling with the cats at home was what I needed this morning. On Saturday morning, I went to my last Wellness Jumpstart class and the topic of the day was juicing and smoothies! We made so many great concoctions and they were delicious. My favorite combination was blackberries, kale, parsley, lime, carrot and apple. A whole lot of flavors going on in there, but it was amazing! 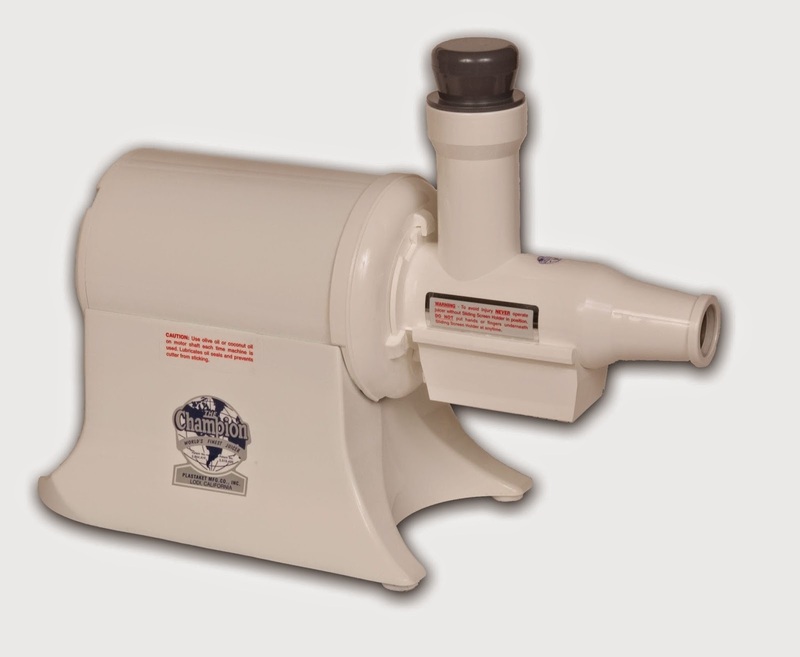 The teacher used one of these Champion juicers and the clean-up was so much easier than my Jack LaLanne juicer. We all got to use the juicer and thought it was foolproof. One thing that I am still stuck with is finding a good book to read. I keep picking up titles at the library, but once I start them, I realize that books aren't worth my time. I found a few books at the library tonight and I am hoping they are great! I've only read one other book by JoJo Moyes and I liked it. I just heard about the DNA book in a news article. Since I am on a genetics kick, I figured it's worth checking out. I keep telling people about my 23andMe DNA test and now that my brother got his back and has all sorts of interesting differences from me, I am determined to learn more about genetics. I'll have to write a blog post about my DNA results too. In terms of food, I've also sort of been in a funk in that area and haven't cooked a good meal lately. We ate out a couple of times in the last week. Panera has a few new and healthier items on their menu. On a recent trip there, I ordered the Lentil Quinoa bowl with organic hard-boiled eggs and it was delicious. I finally found the Silk Almond creamer at Target today! I can't wait to try this in my coffee tomorrow morning. Bonus: I didn't see carrageenan on the ingredients list. My grocery store had this flavor of Chobani for only 99 cents for four yogurts. I tried one for dessert tonight and thought it tasted like mint chocolate chip ice cream. And finally, Craig and I went to Chipotle tonight for sofritas day! Basically, if you ordered a sofritas burrito, you'd get another burrito, salad, bowl, or tacos free from tomorrow through the end of February. Unfortunately, our location was out of sofritas, but they let us order another type of burrito and still get the deal. Off to start the JoJo Moyes book! Have a wonderful week! Last Sunday, I left my house barefaced and headed to Mayfair Mall for a 9 a.m. class at Sephora. I had always wanted to try one of their free classes before, but could never get a seat! I randomly came across the skincare basics class a couple of weeks ago and there were spots available, so I reserved one right away. Sephora Beauty Insiders have the best selection of classes available to them, but there are some classes available for non-beauty insiders. A Sephora staff member called me the day before class and told me to come without makeup on, but I seemed to be the only person who did that. Maybe the other women were just naturally pretty and I feel self-conscious without makeup on! Here is the class description from the Sephora site: Understand your skin type and exactly what kind of skincare it needs. Start with Skincare iQ to select the right products, then get your routine down to a science—from cleansing and removing makeup to savvy application techniques for masks, serums, moisturizers, SPF, and BB creams. The Sephora staff were excellent, helpful and great teachers. They helped us identify our foundation colors with the Color IQ and our skincare type with the Skincare IQ. I was glad they identified my foundation color when I had no makeup on because they matched me at a 2Y05 and the last time I had it done, the color was off because I had makeup already applied. It was a hands-on class that involved cleansing the skin with cleansing oils, applying a mask (I tried the Fresh Rose one because I need more moisture in winter), and moisturizing. You could take notes on a sheet they provided that walked students through the following steps: cleanse, treat, moisturize, protect and perfect. I took notes throughout the presentation and thought I'd share them with you. Cleansing oils are hot right now--they break down makeup really well. I've been using the Boscia Makeup Breakup oil for a couple of months and love it. Another class participant said she likes using oil with her Clarisonic and I hadn't thought of paring the two before, so I started trying that out this past week. If you have acne, they advise taking your makeup off and then using a cleanser especially made for breakouts. Ren is one brand they recommended. I see a dermatologist and the main teacher said that whatever my doctor prescribes for topical cream takes priority over other treatments I could purchase over the counter. To remove your eye makeup, soak a cotton pad with the remover, put the pad on your eyes for 5-10 seconds, then wipe away very carefully. The skin under your eyes is very thin and prone to aging quickly, so be careful when cleaning that area. A Clarisonic can clean your skin 6 times better than traditional methods. FOREO from Scandinavia is a new sonic technology product on the market. 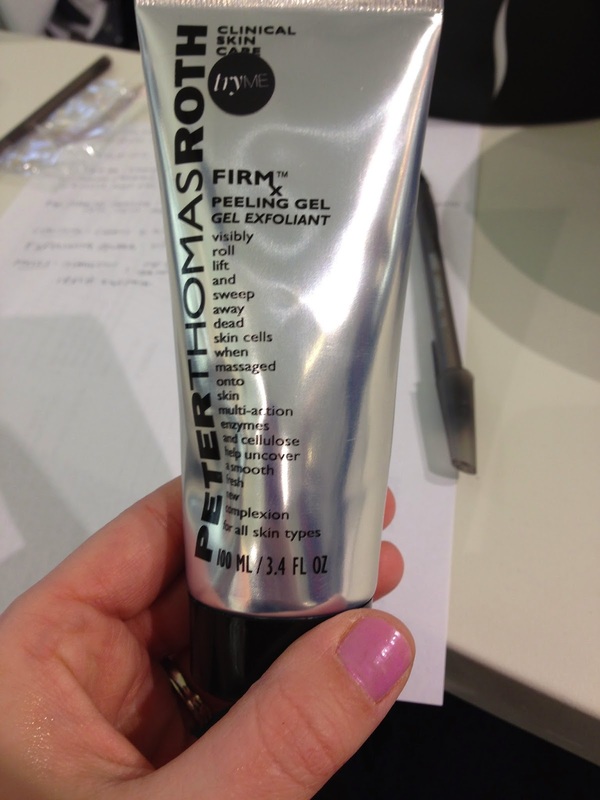 Masks: favorite brands of the Sephora staff were Glamglow, Peter Thomas Roth and Fresh. People with large pores (unfortunately, me) experience a slower aging process (fortunately, me). There's always good and bad sides to everything I guess! Exfoliating powders are something that are new to me. I purchased a Boscia one after the class was over. They also recommended this one from Peter Thomas Roth. Serums and essences: there is a new serum from Clinique out on the market that took 10 years to make. It's called the Smart Custom-Repair Serum. When you apply moisturizer to your skin, pat it on instead of rubbing it in. Because I have acne prone skin, they recommended using something oil-free. I tried the Kate Somerville Oil-Free moisturizer in class. I heard this from my dermatologist recently and am constantly reading this fact. The majority of your aging will result from sun exposure, so make sure to use sunscreen, even in winter! Class ended at about 10:30 a.m. so they could prep the store for opening that day. One more thing to note--the Sephora staff did not pressure us to purchase anything, nor did they favor one brand. They don't work on commission, so that's a nice aspect of shopping there. I felt weird walking around the mall without makeup on, but I came back for a complimentary makeover that I redeemed for being a Sephora VIB member! I enjoyed learning a few things during the application too. My eyes were really smoky and cool when we were done, but I didn't get a great photo of my makeup to show you. Interested in attending the Sephora Skincare Basics class and have questions? Leave me a comment and I'll answer them! I'd highly recommend the class, even if you think you know a lot about beauty and read about it as much as I do. It would be really fun to do with a teenage daughter or female friends! Many of you are likely trying to adopt healthier habits in 2015, so here are some motivational links to check out. Happy Wellness Wednesday! 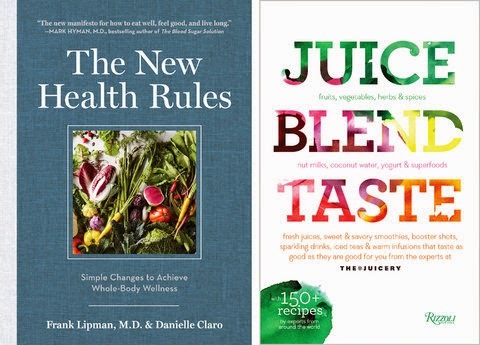 I am excited to read The New Health Rules by Dr. Frank Lipman, and it just got added to my Amazon wish list. I found it in this article, which also mentions another book that interests me--Juice. Blend. Taste. Did you hear that the DASH diet was named best diet of the year? It stands for Dietary Approaches to Stop Hypertension. It's a diet rich in vegetables, whole grains and low-fat dairy. Basically, this is the diet I follow as a vegetarian. It just works for my body and medical needs. A New York Times article entitled "A Year of Workouts, Condensed" which is an interesting read. Oatmeal is back in the news as possibly being the key to a longer life. I can't always eat it first thing in the morning, but I have been eating it when I get to work lately with a little bit of peanut butter and it keeps me so full all morning! Finally, I am super excited that the new FitBit Charge HR just came out yesterday! I'm probably going to buy the Charge HR and wait on the Apple Watch until it's 2nd or 3rd generation. Disclosure: I received a pair of shoes in exchange for this review. I was not compensated in any other way. All opinions are my own. I love trying new athletic shoes (who doesn't) and I've always been a huge fan of ASICS. Thanks to my ambassadorship with FitFluential, I was lucky enough to receive a pair of the new ASICS GEL-Fit Sana to try out. I ordered the black/white/coral pair because I've wanted a pair of darker training shoes for a while. There are so many bright and beautiful colors to choose from though! I normally wear a size 8 in athletic shoes and a 7.5 in dress shoes. I was worried the 8 might be a little big, but they fit perfectly. I wear a thinner sock when I wear these. I've worn my shoes outdoors and indoors numerous times now. I ran errands in them because I thought they looked great with jeans and they proved to be very comfortable. They were also great on a neighborhood walk before snow came and covered our sidewalks. They've also been wonderful for indoor workouts. I have worn them while doing kettle bell swings, Swiss Ball workouts and Wii running! I have found them to be very light and yet supportive overall. The low-profile midsole provides a barefoot-like feeling. ASICS also states that the shoe offers a customized fit because it adapts and supports your foot with the inner lining from the heel to the forefoot. If you are looking for a cross training shoe that is light and has a glove like feel, these are the shoes for you! The MSRP is $80. Let me know if you have any questions about my experience with the ASICS GEL-Fit Sana! How was your weekend? Mine was rejuvenating! We started out our weekend shopping for ottomans at a number of stores. I'd like one that hinges open with storage. Many of my favorites were at HomeGoods, but they didn't have storage. I really like this chevron one, but I am not sure if I'll get sick of the print eventually. After shopping, we headed to Chipotle for some burritos and we shared a Sauza margarita, which was a nice way to end the week. On Saturday morning, I cleaned a little, we shoveled and then I was excited to go to my first Wellness Jumpstart class through the Milwaukee Recreation Department. The class will cover yoga, meditation, massage therapy and juicing in the four weeks I am participating in it. There is just one other woman in my class, which is a little odd, but quite nice! Our teacher led us in an hour plus yoga session and it felt great to stretch and relax. What a great way to start out 2015. Our homework was to read two issues of Natural Awakenings that our teacher brought and bring some interesting things to discuss to next week's class. I read them both and want to ask if anyone has been to a naturopathic doctor before. There was an article about a Milwaukee one and I've always been interested in seeing how they differ from a traditional doctor. I went grocery shopping after class and once I got out of the store, the snow and icy weather had started so I rushed home. I settled in with some magazines, because one of my goals is to get through my piles of magazines early in the year. These are all issues from last summer/fall, so that's how far behind I am in my reading. The other thing I read was the book The Winter People. It's pretty good so far--I am just trying to get a grasp on who all of the characters are and where the plot is headed. I love trying new smoothie recipes, so I took one of the Cranberry Green smoothies from Simple Green smoothies and made it for us for dinner. Craig ended up drinking most of it because he needs his greens and fruit more than I do! I started out my Sunday in a typical way, by watching the Today show and CBS Sunday Morning. I made us blueberry pancakes, which Pema desperately wanted to try too. Alas, there was more shoveling to do after breakfast. The kitties watched us with curiosity and also loved seeing the snow falling all day. I'll end my relaxing weekend by watching the first episode in Season Five of Downton Abbey tonight! Will you be watching? It looks like it will be quite the dramatic season.